Bua 9 is a welcome addition to Columbia City's “Restaurant Row” — speedy, affordable, accommodating for vegans and vegetarians, with a selection that goes beyond the basics. Bua 9 is a welcome addition to the neighborhood’s “Restaurant Row” — speedy, affordable, accommodating for vegans and vegetarians, with a selection that goes beyond the basics. It’s a simple space, with near-empty beige walls and a matching tile floor, plus a spacious counter for takeout orders. The wall of southwest-facing windows provides both people- and puppy-watching fun and Rainier-Avenue-scary-driver-watching anxiety, while the open kitchen offers glimpses of impressive care with ingredients, like the whole chicken, clawed feet and all, that came out of the fridge when a chicken stir-fry was ordered. The menu: Entertainingly encased in yacht rock album covers, the menus offer a multitude of noodles in either soups or stir-fries, from pad thai (brown and tangy, not pink and sweet) to hard-to-find khao soi curry soup and the Thai street-food classic ba mee hang, with ramen noodles stir-fried in garlicky fish sauce brightened with fresh greens. Shorter sections of curries, salads, fried rice and entrees (all of which are stir-fries) round things off. The spice level: Even with the star rating as an attempt to standardize heat, spiciness is a subjective experience. 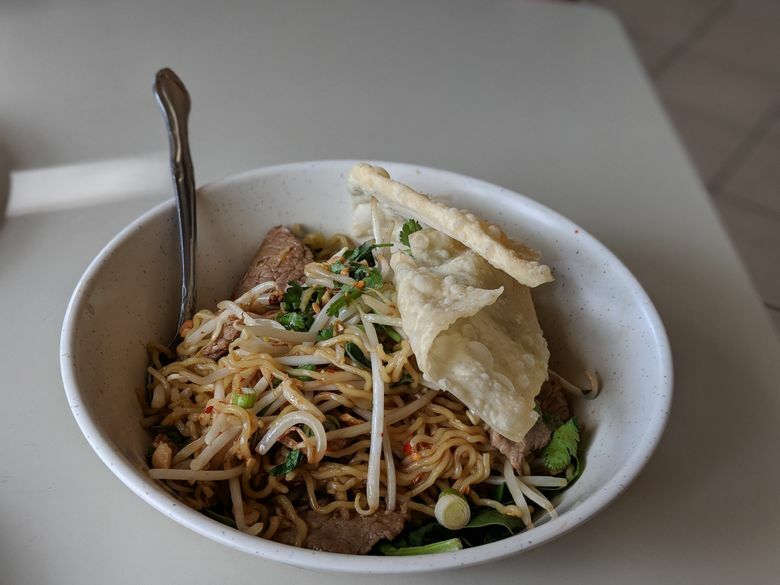 That said, the spiciness here is on average, one to one-and-a-half clicks higher than Seattle’s standard — if you typically order three stars, start with two, and consider bumping down to one. If you routinely order five stars and still doctor the food with chiles, you will be delighted. For the heat-averse, stick with zero stars. 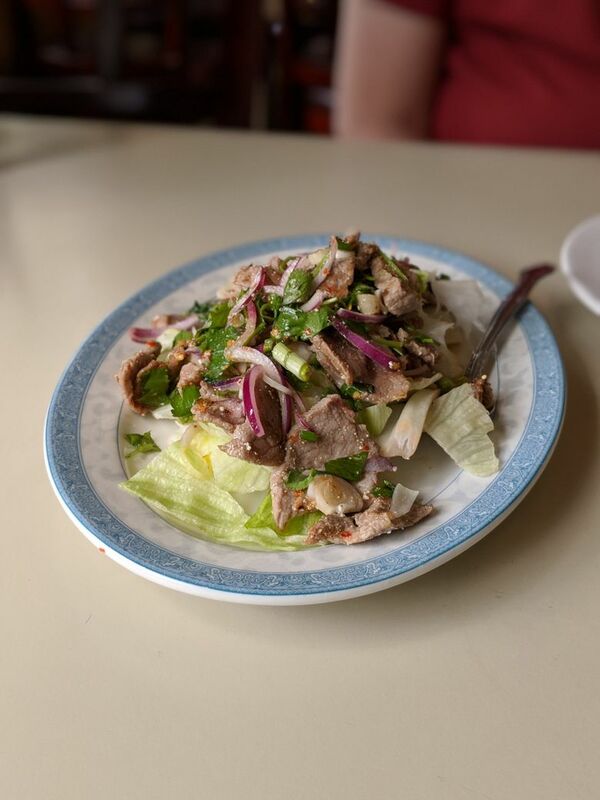 The standouts: Namtok is the perfect salad for a hot day, thanks to the lime-juice-and-chili-paste dressing; sliced red and green onions play off the protein of your choice (thin-sliced pork is very tender) and a bit of cilantro, while chopped lettuce gives some necessary crunch. The panang curry is thick and rich, even for a curry that is meant to be thick and rich — with lime, coconut milk and lemongrassy panang curry paste, it’s a well-balanced bowl of comfort food. 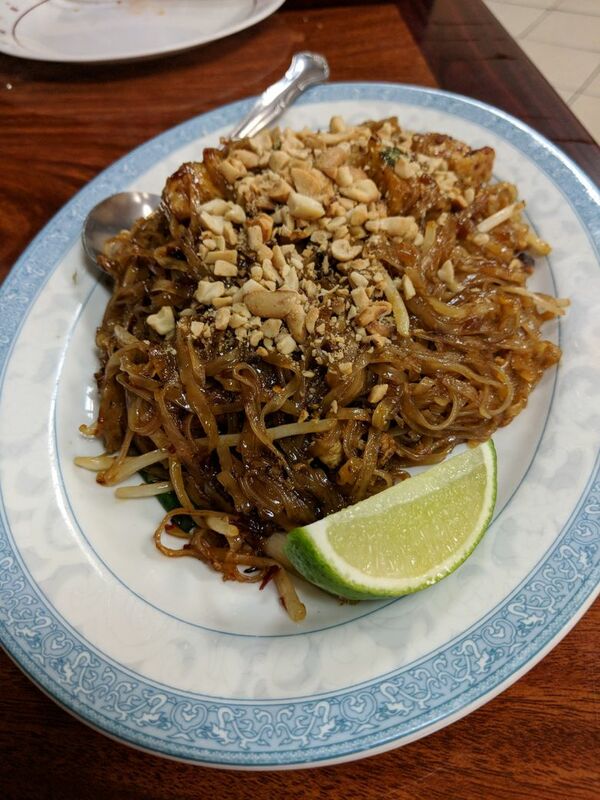 Prices: Pad thai ($12.95), namtok ($11.95) and hot tea ($1.50) added up to a $26.40 (plus tax and tip); lunch for two. Panang curry ($12.95), ba mee hang ($12.95) and iced tea ($3) equaled $28.90 (plus tax and tip) for dinner for two, with leftovers.